Roland’s Drain Cleaning offers professional residential and commercial sewer and drain cleaning services throughout the Niagara Region. If you notice unsightly waste on the floor or in the shower, it’s likely your sewer is backed up. Roland is equipped to unclog your toilet, shower and more! Check out our article in Niagara This Week and learn about all of the services Roland's Drain Cleaning can offer you! Contact us if you have any questions. Whether it’s a clogged drain or you just want to maintain your sewer, Roland’s Drain Cleaning in Niagara Region is the name you can trust. We provide thorough drain cleaning services to ensure everything is in complete operational order. Using our camera, we are able to locate the exact source of your drain problem. This way we can provide you with the appropriate solution the first time around. When it comes to routine maintenance, our camera can spot any breaks or other potential issues so we can offer a preventative maintenance solution. When you call Roland’s Drain Cleaning, you will be speaking and having your work done by the owner, Roland. There are no co-op students or trainees working on your home or business, Roland does all the work himself. Roland offers courteous and professional service, always using boot covers and treating you and your home with the deserved respect. We required a service call and were referred to Roland. It was so nice to have a polite, easy going and friendly person arrive to solve our issues. I also had reason to call him for my house and received the same courteous service. Very reasonable rates and the best part is that his rate is his rate Mon @ 10 am or Sat @ 3 pm. If you need this type of service, call Roland. Charming Man along with humour and expertise, the clogged toilet was efficiently attended to with laughter and a smile. With many years of experience Roland offers a suite of drain cleaning and maintenance services. We use booties & use drop sheets, we’re always conscientious to leave your space immaculate. Plus, we never charge an overtime rate! With all work done by the owner, count on the name you can trust! Whether you are experiencing clogged drain issues or finding debris on your shower floor, the experts at Roland’s Drain Cleaning in Niagara region can help you clear up your drain issues. 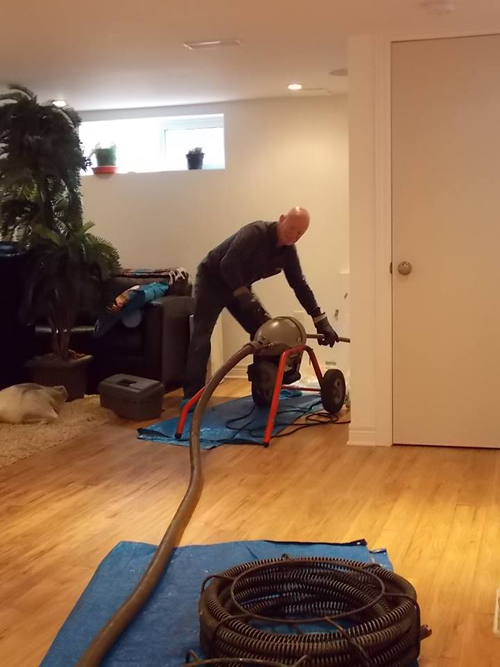 Owner Roland prides himself in delivering professional drain cleaning services for both his residential and commercial customers throughout St. Catharines, Welland, Niagara Falls, Thorold and Niagara-On-The-Lake. Using the latest in camera inspection technology Roland can identify what is causing your drain issues. He applies over eight years of experience to correct the issues for long lasting results. Keeping your home and property free of drain issues is his first priority and he always takes precautions to ensure your property is left in immaculate condition….